The kind folks at Great Ideas For Teaching have agreed to send one of you lucky readers a copy of one of the four activity books that I've reviewed thus far. As these activity books are priced $29 and above, I encourage you all to spread the word!! To enter the giveaway, please take a look at the bottom of this post. I'd love to hear which of the workbooks you'd like and why. Please note that comments require my approval prior to appearing (this prevents spambots from leaving odd and irrelevant public comments). Once a winner is announced, they will be contacted and asked to provide a mailing address so that the book may be shipped. I recently added the Pinterest hover button to make sharing even easier. Simply hover your mouse over the image of interest and click the red Pinterest image. Wow! This is my first full year as a SLP and I am responsible for my entire district. I have recently completed language re-evaluations for one 5th grade student and two MS students - all three scored in the very low/severe range on the CELF-4...uggg! All indicate problems with working memory. I am not quite sure where to start with them and these books look great! As a MS SLP, which would you suggest? I would be very grateful to receive any one of them! 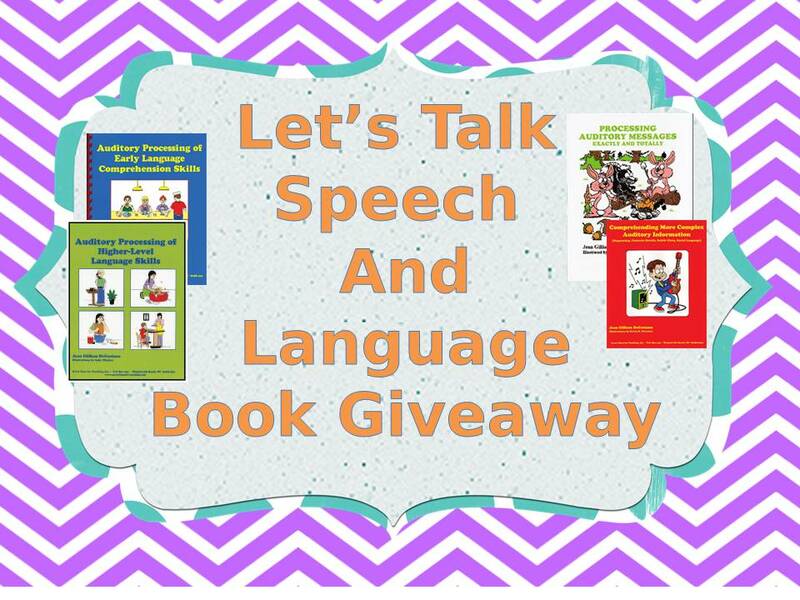 I would love to win a copy of Auditory Processing of Early Language Comprehension Skills. This resource pretty much sums up the work I am doing with most of my caseload. Thanks for the opportunity! I work with early elementary and high school students who have some auditory processing deficits. Any of the books 2,3 and 4 would be of great assistance. I rely mainly on the internet and my own ideas to work with these students. Having one of these books would definatley be of value. Thank you for the offering. I would love to win Comprehending More Complex Auditory Information (Sequencing, Concrete Details, Subtle Clues, Social Language). I am always looking for more materials to challenge my upper elementary students. I,would love a copy of the Early Concepts workbook. It looks perfect for my K-2 students. Thanks for the opportunity. I would say my 1st choice would be: Auditory Processing of Early Language Comprehension Skills, followed closely by Auditory Processing of Higher-Level Language Skills. I think these books would be great for my early and upper elementary students. I like the looks of book #2 as I work primarily with a younger population of students. I would love to win Comprehending More Complex Auditory Information (Sequencing, Concrete Details, Subtle Clues, Social Language). I read your review for this ---I definitely need this for my older kids...was going to write a purchase order but didn't know if they would approve it...would love a copy!!! I think that book number 4 would be very useful for a variety of students. I have several older students that need to work on higher level language skills. 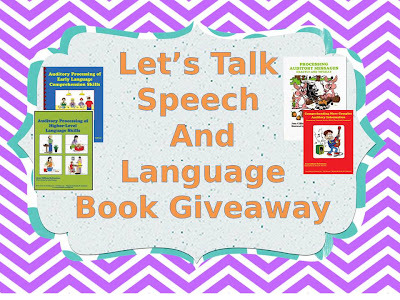 I would love to win Auditory Processing for Early Language Comprehension Skills. This resource would be extremely helpful for a lot of the students on my caseload! Thanks so much for the giveaway! I would love Comprehending More Complex Auditory Information (Sequencing, Concrete Details, Subtle Clues, Social Language) because it would be great for my Junior high kiddos. I would love to get the Processing Auditory Messages Exactly and Totally because it would work with my K-5 grade population well, with the chance for targeting their individual levels (which tend to run low). Thanks! I work with children with hearing loss and I would love Comprehending More Complex Auditory Information (Sequencing, Concrete Details, Subtle Clues, Social Language) as these are areas children with hearing loss have difficulty with. Thanks for sharing the opportunity! I am currently in my final quarter of graduate school and I am focusing on gaining employment as a school-based SLP so I will have the opportunity to work with children who have a variety of needs. I would love Auditory Processing of Early Language Comprehension Skills for my future sessions! Thank you for the opportunity! It is certainly reassuring to be entering a field with so many supportive colleagues! I'm and SLP working in early childhood speech and language and this would be a great reference for my families and myself. I would like the early language workbook since I now work at a kindergarten center. I have the first book, and also find the directions too complex for my students, as well as the pictures being very busy. They work with modifications. I am interested in the 3rd and 4th book - simple pictures and so many language concepts that can be worked on and modified. I work in a collaboarative with students K-3. My choice would be Auditory Processing of Early Language Comprehension Skills. My reason for this choice stems from the importance of Early Intervention (EI). Early identification and intervention of Auditory Processing deficits is vital to a child's future potential. Comprehension of language is essential for expressive language development and academic progress. Effective treatment of Auditory Processing deficits necessitates a clinician who is characteristically prepared, knowledgable, and well-informed with regard to the subject matter. Accountability and successful outcomes are determinate through development of appropriate treatment targets and therapeutic techniques. This book presents as an excellent tool to assist in achieving the requirements to provide service of the highest quality to our EI clients. As a practicing Speech-Language Pathologist and a supervisor and mentor, this thoughtfully-constructed book would serve as my primary resource to address Auditory Processing of language comprehension deficits within the EI, preschool, and school-age population. Oh, how to choose, what to choose. Can I get them all? I have students of varying abilities and each of these books would help with different needs. I think that they would really be great to help with language memory - a struggle for my older students. The books would be nice to share with other teachers. Count me for #3 or #4! I work with middle school students with AP deficits and difficulties with HOTS (higher order thinking skills). I'd love any of the books and would share them with the Communicative Disorders Assistants that I teach at Georgian College in Ontario, Canada. I work in a pediatric clinic setting and all of the books would be a great resource but I think I would get the most use out of books 1 and 2. Number 3 would be the perfect book for the work I do as an SLP with middle schoolers!